Final varnish and protective coating for dry oil and acrylic paintings available in gloss or matte. Protects oil and acrylic paintings from dirt, moisture and scuffing. Non-yellowing, flexible, and quick-drying. It is crystal clear when applied. Can be easily removed with Pure Gum Spirits of Turpentine, Grumtine™, or Odorless Paint Thinner. Available in two sizes: 2.5oz (74ml) and 11.25oz (318ml). 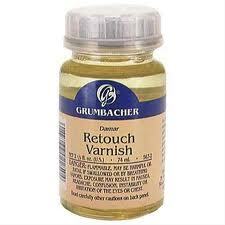 A damar retouch varnish for use during intermediate stages of development in an oil painting to even out gloss of unfinished works, or revive sunken in or dry areas to aid in accurate color comparison for further painting. Can also be used to protect paintings before final varnishing. Transparent, quick-drying, clear, and glossy. Must dry completely before over-painting. When the surface of the painting is dry to the touch, one very light coat of retouch may be applied to it for protection against excessive dust. Use only in thin layers. If this coat produces a gloss, you have applied too much varnish. Not intended as a final varnish. Available in two sizes: 2.5oz (74ml) and 11.25oz (318ml). 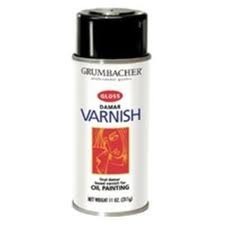 A damar varnish for use during intermediate stages of development in an oil painting to even out gloss of unfinished works, or revive sunken in or dry areas to aid in accurate color comparison for further painting. Can also be used to protect paintings before final varnishing. Transparent, quick-drying, clear, and glossy. Must dry completely before over-painting. When the surface of the painting is dry to the touch, one very light coat of retouch may be applied to it for protection against excessive dust. Use only in thin layers. If this coat produces a gloss, you have applied too much varnish. Not intended as a final varnish. Available in two sizes: 2.5oz (74ml) and 11.25oz (318ml).